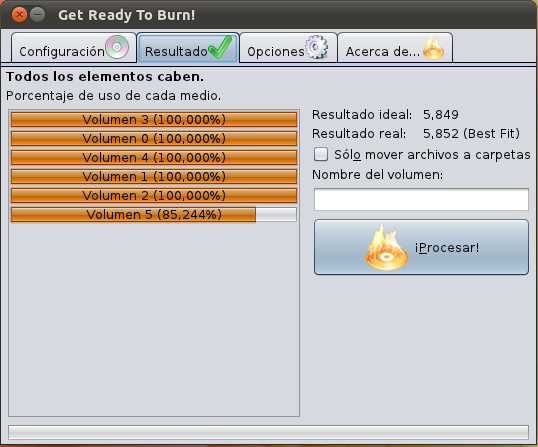 Get Ready To Burn is a program designed to optimize the space required to burn a set of files into any kind of CD or DVD. It works on Windows, Linux, Mac OS X and any other platform that runs Java. It is very simple to use. Just select a folder containing the files you want to organize and the program computes which files go in each disc to minimize wasted space. Supports different CD, DVD and BluRay sizes. Native support to create ISO images (no external tools needed). UDF and ISO 9660 filesystem support. Joliet y Rock Ridge ISO 9660 extensions. UDF revisions 1.02, 2.01 or 2.60. Optionally it can just move files into folders instead or creating the ISO images. Drag y drop folders directly into the program window. It uses 4 algorithms to compute the result (Best Fit, Worst Fit, Next Fit y First Fit) and it chooses the best solution. It’s free and its source code is available under license GPL version 3. On Windows, just double click the downloaded file.